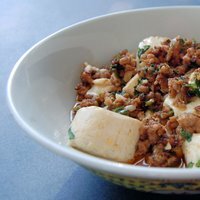 Tofu or bean curd as it is also known is a delectable food made by coagulating soy milk and then pressing the resulting curd into blocks.Originally from china it has spread to other East Asian countries and has been a part of their diet. It is low in calories and has a large amount of iron.Lets see what delish dishes our awesome bloggers has made with this nutritious tofu.The entries are in no particular order. 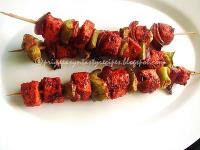 We start with delicious Tandoori Tofu Kebabs from Priya of Easy and Tasty Recipes.Tofu is marinated in chilli powder,pepper and spicy garam masala and is skewered and baked along with cubed bell peppers and onion chunks.Hearty and mouthwateringly spicy dish. Then we come to Tofu with satay sauce from Christine of Kitschow.A delectable dish where tofu in a tube combined with pork and a dash of her favourite satay sauce ,this one is done within 10 minutes. We have Mr.Zhengs Soupy Tomatoes and Eggs with Tofu where TS & JS of EatingClubVancouver have used Northern style Tofu which has more flavour,but also a soy milk aroma and have tried to recreate a traditional dish with a traditional Chinese combo of eggs and tomato. 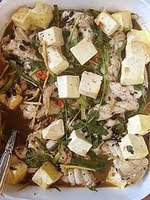 Northern Tofu also makes an appearance in Steamed Fish and Tofu with Chinese Blackbeans where the ingredients like tofu and fish and thrown together along with fermented soybeans to make a hassle free dinner. Tofu makes it appearance this time in Tofu and Squash Dumplings by EJL of Made with Optimism. 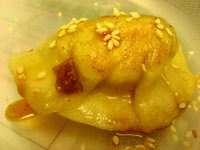 Tofu mixed with banana squash,greenonions,watercress and soysauce is used a filling for dumpling and is cooked in boiling water and is enjoyed heartily.All this after accidently participating in a dumpling making class.Do check her pics for folding a dumpling. Then we welcome Semur tahu of Central Java from Javaholic.Though tofu is almost a regular ingredient she almost forgot to post this dish.Tofu is browned and then mixed with tomatoes,shallots,garlic and sweet soy sauce and is topped with cellophane noodles and hard boiled eggs for a simple and satisfying meal.Do check the post for vegan options. Next we have Vietnamese Dau Hu Chien Sot Ca Chua or Vietnamese Fried Tofu with Tomato Sauce from the creator of Weekend Wokking: Wandering Chopsticks.Here were have tofu lightly battered in rice riceflour and deep fried (or unadorned and pan fried as you like) and then added to a wonderful sauce of tomatoes to which soy sauce or fish sauce has been added. A perfect side dish to rice which can easily be made gluten free and vegan. Last but not the least we have tofu as delicious Indian Style bites from Yours Truly.This has tofu cubes marinated in curry powder and baked to obtain healthy,spicy and tasty bites,all thanks to Madhuram whose recipe I adapted this from. "Its Green in colour and is PopEye's favourite: -" SPINACH ". Do send your entries to the creator of the event Weekend Wokking and also next month's host, Wandering Chopsticks at wanderingchopsticks(at)gmail(dot)com by May 30th,2010. A very lovely round-up.sorry I couldn't send in my entry. 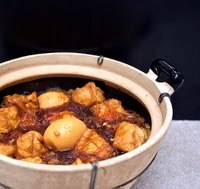 Fantastic roundup..came to learn more tofu dishes through this roundup.. 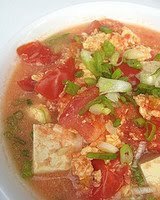 I love tofu and had I known about this event i would have send u some entries .Lovely roundup!!! Great round up - lovely recipes!! I do only scramble that is the only way i can eat! So many delicious entries! Wonderful roundup. Thanks for all your efforts. Very delicious round up indeed! Love all these tofu pointers!